Blue Safety Barrier Netting 50m x 1m Roll. This barrier netting is extremely flexible to use, ..
Orange Safety Barrier Netting 50m x 1m Roll. 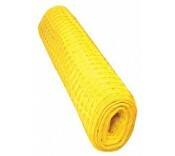 This barrier netting is extremely flexible to use..
Yellow Safety Barrier Netting 50m x 1m Roll. This barrier netting is extremely flexible to use..
Green Barrier Mesh Netting 50m x 1m Roll. This barrier netting is extremely flexible to use, i.. This barrier tape is a popular demarcation tape traditionally used with road cones or fencing pin..
Fluorescent orange tape 25m roll. Ideal for demarcation and for use with road cones or fencin..
Fluorescent orange tape 250m roll. Ideal for demarcation and for use with road cones or fenci.. This bunting tape consists of 32 red and white plastic markers suspended on a 26m plastic co..